Allergy season is in full swing, and many people are more aware than ever of their sinus issues. Recurrent sinusitis often feels as though people are trapped in a cycle of sinus infection followed by medication, followed by another sinus infection, followed by more medication. Recurrent sinusitis can take a significant toll on a person’s quality of life that affects work, sleep, and social situations. Sinus surgerycan help patients correct internal issues that cause chronic recurrent sinusitis and can alleviate symptoms. Sinus infections are one of the most common illnesses in the United States, affecting more than 40 million Americans each year. Sinus infections can produce miserable symptoms of headaches, nasal pain, nasal drainage and/or stuffiness, and the inability to function throughout normal activities. For those with chronic or recurrent sinus infections, life is constantly interrupted. Sinus surgery can alleviate chronic recurrent sinusitis to relieve nasal blockage and remove large polyps that have formed in the nasal cavity. The goal of sinus surgery is to make drainage of the sinuses better so that infection is not caused by mucus becoming trapped in the nasal cavity. For those with recurrent sinusitis, surgery is often the only means of completely eliminating sinusitis. Infected, swollen, or damaged tissues inside the nasal cavity can greatly contribute to sinus infections. Polyps inside the sinuses, as well as broken or misplaced bone, can lead to a backup of mucus that sits inside the nasal cavity and causes a growth of bacteria to form and infect the sinuses. Dr. Maurice Khosh is an expert in sinus surgery using techniques that correct a deviated septum or to remove sinus obstruction. 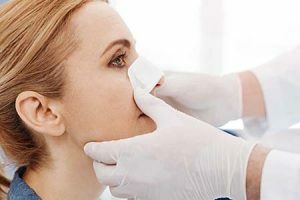 Endoscopic surgery and a more recent technique called “balloon dilation sinuplasty” are regular treatment choices used to treat recurrent sinusitis. Dr. Khosh is a highly regarded, esteemed facial plastic surgeon who has expertise in performing sinus surgery. He has been continually recognized by patients as a compassionate and exceptional doctor, as well as his colleagues, having received multiple awards and the Best Doctor’s in America award. If you suffer from recurrent sinusitis and would like information regarding sinus surgery, contact our office today to schedule a consultation for more information.